About Charter Sailing » Blog Archive » Docking: Lucky or not? 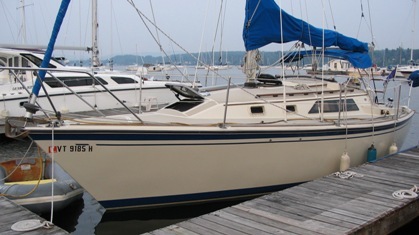 On our first charter on Lake Champlain in 2005, we were faced with our first chance to dock the Oday 28 with just the two of us. Even though we had docked our own Oday 28 in Charleston, SC, more than a dozen times or so with currents of up to 3 knots, we wanted to get this one right. One of the reasons we picked Lake Champlain over many other destinations, including the BVI, New England coast or the San Juan Islands, was that we could get more experience sailing together as a couple without the added concerns (and tensions) of tides and currents. We had reservations for a slip at Westport Marina. As we approached the marina under power, we called the marina on the radio without success. Luckily we had the marina’s telephone number in our planning book so we called using our cell phone (not something we had ever done in Charleston). On the phone, we asked the marina a number of questions regarding choices of slips, the direction and speed of the wind, etc. We decided to take a windward slip since it would be on our port side so we could make use of the light wind and the prop walk of our right-handed prop on the Oday to stop and ease us up to the dock. We asked for a few dock hands to help with the lines just in case, but when we approached the hands were waiting at the wrong slip. We calmly (that doesn’t always happen) stopped the boat and stood off from the slip and motioned that we were docking at the other slip. The hands moved promptly and we proceeded according to plan as we swung wide to port into the slip and let the prop walk and light breeze lay us up against the finger slip on the port side. The dock hands said it was the best docking they had seen all summer. YES! They gave us a grade of “A” and said they would have given us an “A+”, if we had backed in (haven’t done that yet). Plan you approach & make choices consistent with your comfort and skill level. Ask for help at the dock with lines if you are short handed (or your crew is inexperienced). “Make use of mother nature” (we learned this one at Ocean Sailing Academy in Charleston). In other words, make good use of winds and current and don’t try to fight them with the small motor of a sailboat. Make use of the boat design/mechanics (i.e., make any prop walk work to your advantage). Have a backup or escape plan. If the docking is not going as expected, back-out (or pull-out) and try again. Don’t push it. Better to back off and eat crow than damage the charter boat or neighboring yachts. If you have any docking stories (good or bad) or would like to add other recommendations or lessons learned, please comment. This entry was posted on Thursday, July 19th, 2007 at 10:33 pm	and is filed under Docking. You can follow any responses to this entry through the RSS 2.0 feed. Both comments and pings are currently closed.